I'm back with day two of the WPlus9 October Release. 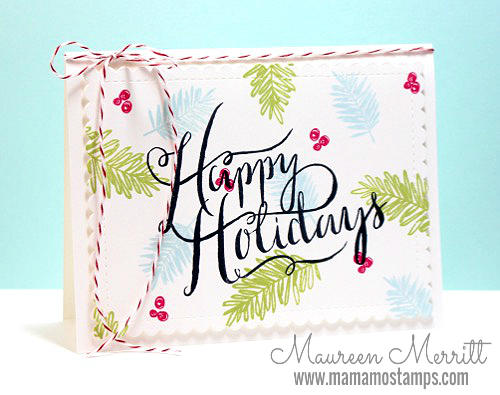 Today I'm featuring the Holiday boughs stamp set. I love the big, bold, graphic, scripty sentiment included in Holiday Boughs. It's definitely gorgeous enough to stand alone on a super crisp CAS Christmas card but it also looks just gorgeous stamped with the boughs and berries. Like I said yesterday, I'm having fun this year playing with different color combos for Christmas. I threw Lake House into the mix here and I think it works wonderfully. Beautiful, those are some must have stamps. Very pretty font on that sentiment! I love that you made some of the boughs blue. It's unique and so pretty. Beautiful card. I love all the colour you used! Gorgeous card, love the handwriting!! I want those beautiful boughs like NOW Maureen! the loopy one is calling my name! Maureen, this card is truly beautiful. I just love it! Great job!